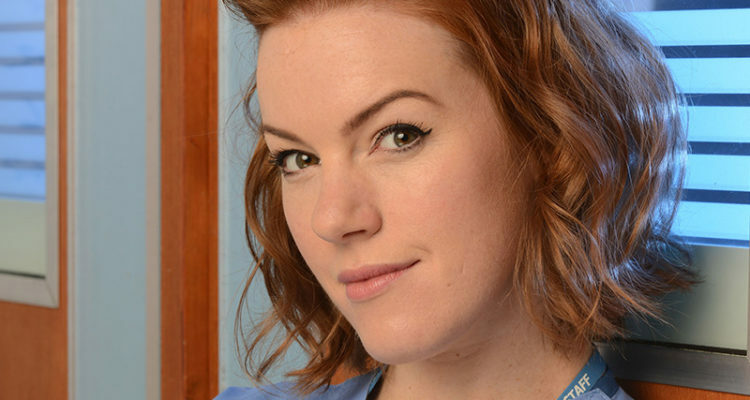 Irish actress Niamh McGrady was first seen on HOLBY CITY back in 2009 as a semi-regular, however viewers are set to see more of her this year now she has been made a regular cast member, in her role as nurse Mary-Claire. What can we expect from your character Mary-Claire this year? More of the same. She’s still cheeky, flirtatious and getting into all sorts of trouble, rubbing people up the wrong way. Lots of that kind of thing! When Harry arrives on AAU; he’s very dashing and handsome so for her it’s like a red rag to a bull. She’s straight in there and doesn’t waste any time! Are you pleased to have been given a regular role in the show now? I’m over the moon! To have been on the show for so long and then for them to suddenly offer me a regular role, it was lovely news so yes I’m delighted to be here full time. I’m really excited about the fact that we’ll get to see more of Mary-Claire and fill in more of her background and see who she really is. It will be great to get her into some proper storylines. There’s a million places you could go with Mary-Claire. For me nothing’s quite been finalised yet but they’ll certainly be more of her background coming through and hopefully some romance as well. 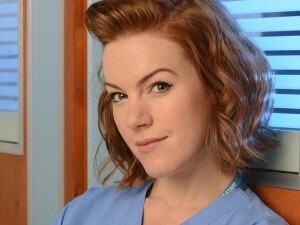 Have you had a lot of support from people wanting to see more of Mary-Claire on Holby? I’ve had so much support so I would love to thank everybody who follows me on Twitter, as I get amazing tweets from people who watch the show especially if I’m in an episode. Twitter is an amazing medium for getting immediate feedback from people who are watching the show who you might never usually be in contact with so it’s really lovely and I appreciate that support. I’ve also had the support from other cast and crew who have all been really pleased that Mary-Claire has been made a regular. Do you have your own dressing room now? Yes I do, I’ve already put some coloured fairy lights up. I’ve got to get a disco ball in there, maybe a smoke screen – make it the official Holby after party! I might do it just for a giggle! Catherine Russell’s dressing room is the most amazing thing you’ve ever seen – everything matching – it’s gorgeous so when I saw that I thought that’s what I’ve got to complete with! What’s it been like working with newcomer Jules Knight? Jules is ticking all those boxes. He’s brilliant fun to work with and he’s immediately fitted right in. There’s a lot of fun over in AAU at the minute, I think the other wards are a bit jealous! Singing lots of show tunes, being really camp and silly so we’re having a great time. I have to remind myself that it is work but it is good fun. We’ve all taken Jules under our wing but we do that with any actor that comes in because we’re a pre-existing family. It can be intimidating for anyone coming in so we’re all very nurturing. He’s in very good hands! Will there be some rivalry between Mary-Claire and Gemma? I think there will be some friction there, yes. I’ve read it says ‘battle lines will be drawn’! Gemma and Mary-Claire have got a good working relationship; they are professional with each other so it will be interesting to see where that goes. Mary-Claire doesn’t let Chantelle get in the way of any men either so we can only imagine where this is going to go. But as yet I don’t know. Let’s hope she doesn’t misbehave too much! Do you think you could be friends with someone like Mary-Claire? Yes and no. She’s a really good crack and she’s good fun but you want mates you can trust especially with your boy and she did totally go after Rhys despite Chantelle’s feelings. I don’t want to say no because when you play a character for so long, weirdly you feel like you know them really well and feel quite close to them but would I be friends with Mary-Claire? At arm’s length friendship; I’d go out for a night dancing with her but not be best friends! Would you like to see her form more close female friendships? Hopefully because the thing about Mary-Claire is she’s very much her own person. She fights her own battles, and stands her own ground. She’s a little bit man obsessed. But who are her best girl mates? Who does she go to when she’s had a bad day? So that’s something I really want to see, see her having some strong, trustworthy relationships. She needs to learn the value of friendship that’s something she needs to explore herself. It would be nice for someone to come a long and stand up for her, I don’t think anyone’s every stood up for her before, she’s always been fighting along on her own. A female united front would be good for her. Do you share any similarities with her? She’s very gregarious, social and flirtatious and you know I am as well! She’s also a bit cheeky and lazy; I am as well. But those would be the only things! When I get a script and I see some of the things she does; its brilliant fun to play but it’s a further step than I would ever take in real life. She’s very badly behaved but I wouldn’t dream of saying some of the things she comes out with! Despite coming off very confident, do you think Mary-Claire has any weaknesses? That’s the whole nice thing about being a regular now that we’ll get to see another side to her. Ultimately she wants to meet the one and I think it’s all coming through her own insecurities. The chasing men relentlessly – maybe she’s not quite as confident deep down about that kind of stuff. She’s not two dimensional; we see her misbehaving but there’s an awful lot more to her than that. So I’m excited to now get the chance to explore all of that within the show. Have we seen her vulnerabilities before? You saw a glimpse of her vulnerable when Greg left because she adored him. I think she cared a lot about him. So that’s the kind of side of Mary-Claire I’d like to explore. She’s not just single minded and selfish. She’s caring in her job and she’s generous in many ways. Do you get recognised much? Very rarely. I got recognised last week. There’s a couple of people in my local Tesco’s who watch Holby so every time I’m in there they like to know what people are up to. During Christmas, I was home in Northern Ireland and I’m from such a small place, where everybody knows everybody and I’d be walking down the street and someone would yell across at me ‘You’re awful bad to that wee blonde nurse! But it is nice for my family and friends back home, they love knowing someone who’s on the telly! No I wanted to be a vet, deadly seriously! But I’m really bad at science and all those subjects that you need to be able to do that so once I knew that a vet was never going to happen, I just didn’t really think about it. I always did music and drama, I suppose it was staring me in the face and I didn’t realise. I guess I didn’t think it was possible because I’m from way out in the countryside, I didn’t know anyone who was an actor; that world seemed very out of reach that I thought it wasn’t a possibility. But somehow I’ve managed it! I was doing A Level Theatre Studies and had a parent/teacher meeting, my mum came along and the teacher asked had I thought about a career in acting. I laughed. It was really jammy how I got into drama school and I ended up getting into the Royal Welsh Academy of Music and Drama. I had no idea that people try for years to get into drama school whereas I just kind of fluked getting in. I went to Cardiff for a public speaking competition that we’d won in Northern Ireland and the final was over in Cardiff, so I then applied to do things like Art History and all sorts of other stuff as I thought Cardiff looked amazing and I wanted to be there. So I auditioned for RWAMD and got in. How did you find drama school? As a result of that flukiness and not realising how hard it would be, I did find drama school quite difficult. It’s quite full on, very competitive and I hadn’t experienced any of that before so I was a bit out of my depth. I thought I was dead street wise and in a way I was ­­­­but I wasn’t ready for all that competitiveness in a career way. By the time I got to third year, I’d figured myself out. I’ve never put any big demands on myself. The best advice I’ve ever been given about acting is that it’s a marathon not a sprint. You know, it’s the long game so I’m really delighted the older I get the more work seems to be coming in. Getting this contract here, I feel so lucky because it’s not the same for all actors. A lot of my friends aren’t working, or are struggling or have given up. It’s not an easy profession but I still feel really lucky. Did you go drama school with anyone else famous? Weirdly, Adam Best was in my year at drama school. He was in Holby years ago playing Matt Parker. How long would you like to stay at Holby? Holby is amazing and the happiest place in the world. I would really like to be here for long enough so that Mary-Claire would be properly investigated in all situations. It would be nice to have some big serious drama she has to deal with to see how she’ll cope with that and also more fun stuff. Long enough to see all sides of her! Who are your closest friends at Holby? I’m sure everyone says it but we do all get on ever so well. We’re very close. Also actors have that weird thing that you have to get on quickly in a short space of time. Bob Barrett I just adore. I get on amazingly with Ty, Jules, Catherine… All of them! James I’ve known for a long time; he’s been in the show longer than me and he lives near me in East London. We spend the week always so busy that it would be nice to spend more time outside of Holby but I guess everyone has to disappear back into their own lives. Do you get back to your homeland of Northern Ireland much? I do but not as often as I’d like. I did a series there last year and got to live at home for three months which was great. Apart from that I go home at Christmas and other occasions. I’ve lived away since I was 18; my mum and dad like me being at home though. Plus it’s the countryside, I do need my countryside fix. London is brilliant and I love the buzz and excitement but every now and again I just want to look at some fields and not have to worry about anything! No Comments on "Niamh McGrady Interview"